Tenacious...adaptable...enduring...spiritual - words that characterize the largest and most influential Indian tribe in North America... The Navajo Nation. Since the Long Walk in the 1860's, the Navajo Nation decimated to a population of only 8,000. It has increased to a stronghold of more than 210,000. About 60 percent of Navajos are 24 years old or younger. In its infancy, the Navajo Nation governed itself by a complex language and clan system. The discovery of oil in the early 1920's clarified the need for a more systematic form of government. So, in 1923, the Navajos established a tribal government; thus providing an entity to deal with American oil companies wishing to lease Navajoland for exploration. Today, the Navajo Nation Council has grown into the largest and most sophisticated American Indian government in the U.S. , it was reorganized in 1991 to form a three branch government - executive, legislative and judicial. It embodies an elected tribal President, Vice-president and 88 council delegates representing 110 local units of government (known as chapters) throughout the Navajo Nation. Council delegates meet a minimum of four times a year as a full body in Window Rock, Arizona, the Navajo Nation capital. In addition to their duties as chapter representatives, council delegates also are appointed by the tribal council to serve on at least one of 11 standing tribal committees. The Navajo Nation continues to forge ahead in its goal to attain economic self-sufficiency . Yet in the midst of it all, the Dineh (or the People) still adhere to their cultural, social and traditional values; the same tenacious values that have made the Navajo Nation unique and fascinating throughout its history. The traditional history of the Navajo Nation, with its strong emphasis on adapting trends with modern day America will continue to perpetuate the enduring Navajo into the future. To help revitalize its economy, the Navajo Nation has recently undertaken steps to develop, strengthen and manage an even increasing tourism industry. Despite the fact that most tourists visit Arizona to see cowboys and Indians, it is estimated that only 7 percent of a nearly $550 million industry ever reaches the Navajo Nation. With the formation of the "Navajo Tourism Master Plan" it is hoped that the Navajo Nation will be able to reach more than 20% of tourism expenditures by the year 2000, creating some 5,000 jobs. Outsiders do not perceive Navajoland as the Navajo, as the sacred homeland created for the Dineh. This strong spiritual belief in the land requires that Mother Earth be treated with the deepest respect. The arid-looking surface of Navajoland belies what lies underneath a world of hidden treasures...tons of oil, gas, coal and uranium...waiting to be tapped. In 1987 alone, some $43 million was poured into the Navajo Nation's coffers from mineral royalty payments. Coal alone contributed $28 million to the tribal treasury. Minerals excavated from Navajoland not only benefit the Navajo Nation, but also provide various forms of energy to millions of people throughout the United States. With a burgeoning population, the Navajo Nation has found it necessary to increase its landbase substantially over the past several years. Some 17.5 million acres have been added to tribal lands. And there are plans to increase this base even more. In addition to its mineral resources, the Navajo Reservation embodies some of the most awesome and spectacular scenery in the world. More than 15 national monuments, tribal parks, and historic sites are found within its vastness. For avid water sports enthusiasts, Navajoland encompasses a dozen different fishing lakes and ponds, scattered throughout the sprawling 26,000 square-mile reservation. Lake Powell alone - boast some 186 miles of water front and 2,000 miles of shoreline - more than the entire West Coast! The stark and incredible beauty of the Navajo Reservation - spilling over into the states of Arizona, New Mexico and Utah - is an irresistible magnet to film and television producers from all over the world. Canyon de Chelly National Park, Monument Valley, Tribal Park, the Little Colorado River and Rainbow Bridge National Monument, are only a few of the sites that have been immortalized on the silver screen. Frequently visited attractions include Chaco Culture National Historical Park, Navajo National Monument, Window Rock, Four Corners Monument, Petrified Forest National Park and the Bistri Badlands. Navajo legend tells us that the Dineh had to pass through three different worlds before emerging into the present world - the Fourth World or Glittering World. So, the Holy People put four sacred mountains in four different directions. Mt. Blanca in the east. Mt. Taylor in the south, San Francisco Peaks in the west, and Mt. Hesperus in the north, thus creating the boundaries of Navajoland. Centuries ago, the Navajo people were taught by the Holy People to live in harmony with Mother Earth and how to conduct their many activities of everyday life. The Dineh believe there are two classes of beings: the Earth People and the Holy People. The earth People are ordinary mortals, while the Holy People are spiritual beings that cannot be seen. Holy People are believed to aid or harm Earth People. When disorder evolves in a Navajo's life, such as illness, herbs, medicinemen (diagnosticians), prayers, songs and ceremonies are used to help cure the ailment. Some tribal members prefer modern day hospitals on the Navajo Reservation; some seek the assistance of a traditional Navajo medicineman, some combine both methods. Navajos believe that a medicineman is a uniquely qualified individual bestowed with supernatural powers to diagnose a person's problem and to heal or cure illnesses. The Dineh believe they are sustained as a nation because of their enduring faith in the Great Spirit. And because of their strong spirituality, the Navajo people believe they will continue to survive as an Indian nation forever. For generations, traditional Navajo dishes have been handed down from grandmother to mother to daughter without being written down. Besides being a basic necessity of life, food welcomes visitors and expresses thanks. Traditional Navajos usually cook by memory, measuring their ingredients with hands or fingers. If there is no modern stove, most food is cooked over an open fire. Traditional cooks still use wild plants and vegetables such as spinach, onions, turnips, berries, cactus and cedar brush. For instance, cedar brush is used to add color, a flavor to a popular Navajo delight called blue corn meal pudding. Many Navajos continue to wear traditional clothing daily. Others wear their velvet, turquoise and silver only during ceremonial or social gatherings. The Navajo woman's traditional style of dress consists usually of foot or knee-high moccasins, a pleated velvet or cotton skirt, a matching long-sleeve blouse, concho and/or sash belt, jewelry and a shawl. Men also wear jewelry, moccasins and preferably a velveteen shirt. Although many Navajo people wear contemporary clothing, they continue to carry on their cultural practices by wearing traditional outfits when the occasion requires it. It is believed that before an individual can receive help from the Great Spirit, one must first wear appropriate clothing in order to be recognized. The Navajo people are very dynamic and creative people who strongly believe in the power of the mind to think and create; finding expression in the myriad symbolic creations of the Navajo language, art and ritual ceremonies. The Navajo language embodies a high prevalence of humor in day to day conversation. Humor transforms difficult and frustrating circumstances into bearable and even pleasant situations. The strong emphasis and value Navajos place on humor is evidenced in the First Laugh rite. The first time a Navajo child laughs out loud is a time for honor and celebration. Aside from being the mother tongue of the Navajo Nation, the Navajo language also has played a highly significant role in helping the entire nation. During World War II, the Navajo language was used as a code to confuse the enemy. Navajo bravery and patriotism is unequaled. Navajos were inducted and trained in the U.S. Marine Corps to become "code talkers" on the front-line. Shrouded in secrecy at the time, these men are known today as the famed Navajo Code Talkers, proved to be the only code that could not be broken during World War II. Although not all tribal members speak the language fluently, most Navajos have a deep respect for it. Navajoland offers several culturally-related activities held throughout the year. Pow wows, traditional song and dances, native food competitions and many others are only a sample. Scarcely anything depicts the American Indian more eloquently than his love for dancing. The traditional song and dance and inter-tribal pow wows are only some of the many aspects in which the Navajo Nation continues its cultural tradition. Most social events held in Navajoland are held mainly for pleasure and outsiders are welcome to attend. The traditional song and dance (a ceremony called the Enemyway Ceremony) is an increasingly popular event. One of the reasons an Enemyway Ceremony is conducted is to help cure an individual who has become ill after going to war. The ceremonial dancing is to relieve tension in the patient. Today, the cultural aspects of the ceremony live on through song and dance contests or festivals. Participants dress in their finest traditional Navajo attire and recreate the traditional dances of their forefathers. Although pow wows did not originate with the Navajo people, the Navajo Nation hosts one of the largest intertribal pow wows in North America every summer in Window Rock, Arizona during the Navajo Nation Fair. Most modern-day pow wows are held for pleasure , but certain aspects of the pow wow are sacred and in some cases photographs and tape recorders are forbidden. The Navajo Nation proudly sponsors the "World's Largest American Indian Fair" - the Navajo Nation Fair - attracting visitors from around the world. Held in early September each year, the fair takes place in Window Rock, Arizona, capital of the Navajo Nation, where more than 100,000 people attend the five-day gala. One of the highlights of the fair is the all-Indian rodeo, lassoing in more than 900 Indian cowboys and cowgirls from eight different Indian rodeo associations throughout North America. The Navajo Nation Fair Rodeo offers competition in all events for both men and women. The Navajo Nation Fair offers a variety of other events including horseracing, an inter-tribal pow wow, arts and crafts exhibits of world-renowned Indian artists, Miss Navajo Nation competition, an Indian fry bread contest, a baby contest, concerts, country and western dances, song and dance competition, agricultural exhibits, livestock exhibits, food concessionaires, a carnival, and of course, the Navajo Nation parade through the Window Rock area. Following the Navajo Nation Fair are other Navajo fairs - the annual Shiprock Navajo Fair, held every October in Shiprock, New Mexico. This is the most traditional of all Navajo fairs. Other smaller tribal fairs include the Western Navajo Fair in Tuba City, Arizona, the Eastern Navajo Fair in Crownpoint, New Mexico, and the Central Navajo Fair in Chinle, Arizona; all usually held in early fall. Hearts pound, sides ache, muscles ripple...as men and women of all ages push their bodies to the limit in a 10K run...water sparkles the glints, a sudden breeze rises as you cast a line out to the crafty fish lurking beneath the surface of one of several fishing lakes; a wild cheer, a collective "Oooh"...as the summer crowds cheer their favorite softball team; the buzz of a power boat as it zooms along pulling water skiers in tow. This is Navajoland! Navajoland with its myriad variety of outdoor recreation. Fishing, hunting, running, hiking, cycling, boating, softball, basketball, and numerous other exhilarating activities, challenge the most avid sportsperson. Navajoland offers everything, from some of the most grueling cycling races to highly competitive trophy fishing, ranking among the top outdoor recreation anywhere. Navajoland offers fishing year-round at its 12 major lakes. Most popular are Wheatfields and Tsaile in Arizona, and Whiskey Lake in New Mexico. Most of the tribe's lakes are nestled in the Chuska Mountains located in the east-central area of the Navajo Reservation. Avid fishermen match wits with an array of fish ranging from rainbow and cutthroat trout to channel catfish. If hunting is your bag, Navajoland offers both small and big game hunting. A variety of big game (primarily deer and turkey) hunts are offered beginning in mid September and expanding into December. Most small game is in season year-round. The permits required for fishing, hunting and boating can be obtained from the Navajo Fish and Wildlife Department. Maybe your idea of exercise is to walk and explore? Or maybe bicycle? A road race? The Navajo Nation hosts several such races throughout the year, however, we also offer less competitive exercising with outstanding background beauty. Throughout the spring and summer, Navajoland is inundated with distance runners and cyclists warming the muscles and taking part in one or more of a host of races. Navajos have long been famous for their long distance running ability. With this challenge and beauty-filled background, Navajoland becomes a "special" magnet for racers from all over the Southwest. Cyclists from all over the Southwest venture onto the reservation battling the uphill challenge of the Chuska Mountains and the unrelenting sun of the great Navajo Nation. So, when you think you're ready...pick up the tanning lotion , loosen up those muscles, and come on out to the Navajo Nation to compete with the best of them in a 5K, 10K, or 25-mile cycling race. If leisure jogging or bicycle riding is more your pace, Navajoland offers spectacular scenic background and crisp, fresh air guaranteed to quicken your pulse and catapult you into a real love affair with Navajoland. Grab your cowboy hat, shine-up your boots, and head out to the Navajo Nation's number one spot - rodeo. Want to see cowboys and Indians? Well, on the Navajo Nation, most cowboys ARE Indians! There are literally hundreds of rodeos in Navajoland. In fact, the Navajo Nation hosts more Indian rodeos than any other tribe in the United States and Canada combined. Even during the winter months, Navajos continue jackpot team roping and bull riding competition. Virtually every region of the Navajo Nation hosts a rodeo during the summer, offering participation in all events for both men and women. The Navajo Nation Rodeo Cowboys Association and the All-Indian Rodeo Cowboys Association hosts several rodeos on the Navajo Reservation throughout the season. Yaahoooooooooo! Love those Indian rodeos! Navajo rugs, their unique silversmithing, and distinctive baskets are recognized throughout the world. Everyone loves Indian art - particularly Navajo art. Yet most guests visiting the Navajo Nation are not aware of the history or significance of most artwork to the Navajo people. Nor do most guests understand what constitutes "authentic" Navajo crafts. Concho belts are commonly worn by both men and women throughout Navajoland as daily or ceremonial wear. This "Storyteller" belt is a unique design of Navajo craftmanship (on the right). Fascination for Navajo weaving is unequaled from its arts and crafts enthusiasts throughout the world, not only because of its aesthetic qualities, but also because of its unique stylistic changes. Navajo legend teaches that Navajo women learned the art of weaving from Spider Woman who constructed a loom according to directions given by Spider Man. They were Holy People who came from the underworld, where weaving was their way of life. 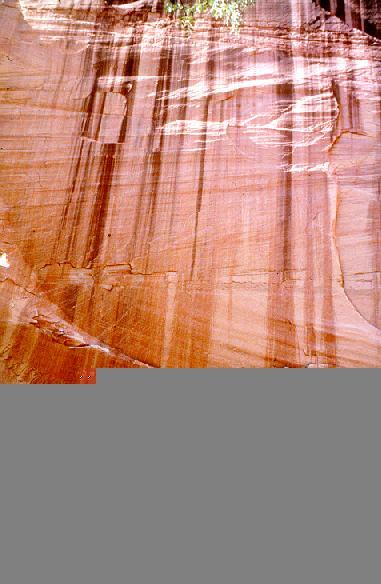 However, others believe that Navajo women learned the technique from Pueblos in the mid-17th Century. Originally Navajo women wove such items as wraparound dresses, tunic-like skirts, breech cloths, and shoulder robes. just prior to 1900, the market for Navajo blankets expanded into rugs and weaving eventually became market-oriented. Today, distinct styles of rugs identify designs from Two Grey Hills, Ganado, and Crystal, which have become famous worldwide. Although many weavers continue in their regional style, some artists who live in the vicinity of two rug regions have become combination-style weavers. Branching out from the traditional rugs are the difficult and complex designs such as the two-faced, pictorial, sandpainting and raised outlook. The saddle blanket, another popular rug, isn't as difficult to make as the others, but is more affordable for the collector on a limited budget. Navajos are unsurpassed in their ability to create exquisite and multifaceted art. Nowhere is this more true than in the beauty of their silversmithing. Introduced by the Spaniards and Mexicans around the middle of the 19th Century, silversmithing Navajos obtained metal by melting down American silver dollars or Mexican pesos. Navajo lore teaches that when the Dineh came from the underworld, First Man brought turquoise with him and directed shovels to be made of turquoise to dig channels and drain much of the water that was present. It's believed that Navajos began working with turquoise after returning from Fort Sumner, New Mexico in 1863. Aside from its ornamental value, turquoise is especially important to the Navajo people because of its ceremonial significance. Today, turquoise is used primarily for ornamentation, but Navajos remember and wear it ceremonially as exemplified in the many rituals still held today. While the art of basketmaking may seem minor, a basket has great symbolic significance because it represents the well-being of an individual, particularly the mind. Navajo lore teaches that Holy People - First Man and First Woman - made baskets when they lived in the underworld for ceremonial purposes. Each part of a Navajo basket has a special significance. The core of the basket represents the emergence of the Holy People into the present world - the Fourth or Glittering World. The area surrounding the core represents the earth. Traditional Navajo baskets have a first layer of black triangular design, representing the four sacred mountains. That area immediately adjacent to the black represents the sky; the red design represents the clouds and darkness. The black triangular designs on the outside of the basket represents the Holy People., including Yellow Corn and Dawn. Finally, the outer edge of the basket represents the association with others. Apart from their ceremonial usage, Navajos also use baskets for ornamentation. Black-on-white prehistoric pottery from the southwest. Background is Mummy Cave, Canyon de Chelly National Monument near Chinle. Sandpaintings are another unique and symbolic art form originating with the Holy People who lived in the underworld. Sandpaintings were, and still are, primarily ceremonial. Depicting the tools used by the Holy People, which were strictly intended for ceremonial purposes, sandpaintings represent an array of ceremonies and sacred songs. However, today many artists create pictures of ceremonial figures for commercial purposes. Sandpainting in itself is not forbidden as long as Holy people are not depicted. A spin-off of ceremonial sandpaintings, are the popular sandpainting nameplates, containers, vases, etc., decorated with figures other than ceremonial. This allows the art form to be collected and enjoyed without compromising sacred ceremonial values. Tribal legend indicates that most Navajo arts and crafts sprang from roots that began with the Holy People. Virtually everything a Navajo says or does is somehow linked with his cultural past, consequently they help him set the course for the future. Navajoland is, as it has always been, a land in transition, a blending of the past and the present, reaching out confidently to embrace the future. Probably the most famous of the Navajoland National Parks. It was the original northwest corner of the Treaty Reservation in 1868. In 1884 an Executive Order annexed the areas north and west of Monument Valley into the present Navajo Reservation. It was established as the first Navajo Tribal Park on July 11, 1958 by the Navajo Tribal Council. 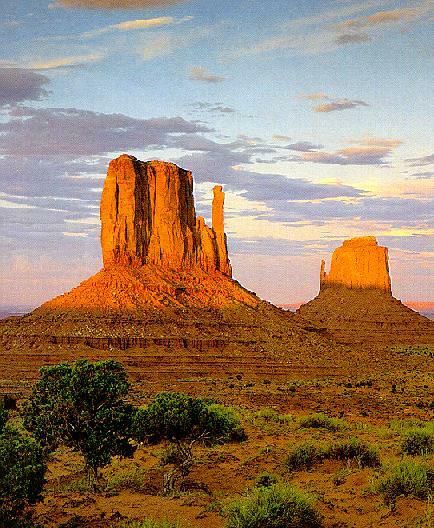 Annually over 400,000 tourists from all over the world visit Monument Valley Tribal Park. 1962 - "How The West Was Won"
1974 - "The Trial of Billy Jack"
1981 - "The Legend of the Lone Ranger"
1990 - "Back To The Future III"
Nowhere throughout Navajoland is it more profound to find a blend of the past and present cultural tradition than at Canyon de Chelly National Monument, one of America's 8 best National Monuments according to National Geographic's Traveler Magazine. It was established as a National Monument in 1931. See how the Navajo people still have a mystical bond to Mother Nature as you partake of the legendary beauty of this magnificent historical site. Located three miles east of Chinle, Arizona on U.S. Highway 191, Canyon de Chelly National Monument houses about five periods of Indian culture dating from 350 AD to 1300 AD. The 26-mile canyon of red stones rise from 30 to 1,000 feet which provide a spectacular backdrop for hundreds of Anasazi ruins, Navajo homes and farms. Thousands of years ago humans moved into this high desert country. The Anasazi's (or as the Navajo people call them; the "Ancient Ones") at first erected simple brush windbreaks and pit houses sunk in the ground; later they built stone villages right into the canyon walls. Then after several droughts about 700 years ago, the Anasazi moved away. Now empty, their time-worn ruins pique the imagination. The stone houses crowd a ledge beneath a 452-foot-high sandstone alcove. Their walls are intact, with many of the stick-and-mud roofs still in place.